Have you ever opened your fridge and had cucumbers over flow out the door and onto your feet and floor? No? Well I have and the first thing that comes to mind is "what the hell am I supposed to do with all these cucumbers?" and right after that I start wondering how we got all these cucumbers. And then my mind starts meandering off and envisioning cucumbers courting each other, getting married, and producing baby cucumbers in my fridge. Which, in the land of Amber's Fridge, it totally plausible. Probable. 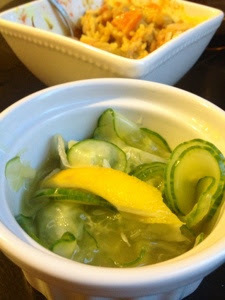 Or you can make this super easy Asian cucumber salad. You know you want to. We all love things that are easy. Its perfect as a cool side to a spicy curry. Mix it up and eat! But if you think ahead, it's better the longer it gets to hang out in the juices; aren't we all?